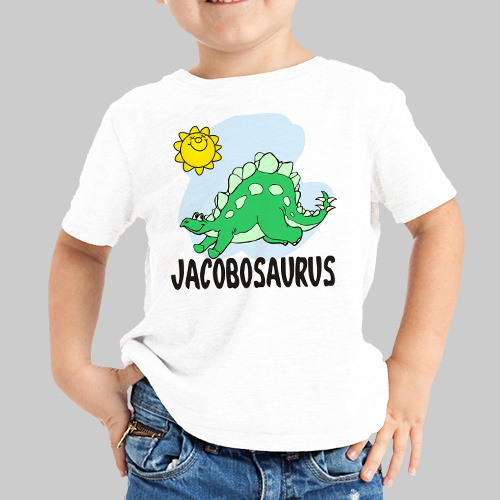 If he loves dinosaurs then he will absolutely love this Nameosaurus Personalized Youth T-Shirt. Show off your boy's name with a dinosaur on our Personalized Nameosaurus Youth T-Shirt for boys as a wonderful birthday gift. Personalized Boys shirt is available on our premium white 100% cotton Personalized T-Shirt, machine washable in youth shirt sizes S-XL. Personalized boys shirt is also available on Ash Gray. Gifts for boys include FREE Personalization! Personalize your Nameosaurus Youth T-Shirt with any boys name. Also make a creative gift for girls. Very cute shirt! Size runs big. Nice deal! Thanks! We also carry an extensive line of Personalized Youth Sweatshirts. Show your children how much you love them with our Personalized T-Shirts & Keepsakes. Our personalized sweatshirts and t-shirts make excellent gifts for birthdays, family reunions and of course Halloween.